6.5x25 CBJ Ball, 6.5x25 CBJ ST, 6.5x25 CBJ HET, 6.5x25 CBJ Subsonic AP, 6.5x25 CBJ Frangible, 6.5x25 CBJ TRP, 6.5x25 CBJ Blank, 6.5x25 CBJ Drill. There are many factors that constitute weapon effectiveness, other than bullet performance in bare tissue even if this, of course, is critical. Weapon effectiveness can be defined as the ability of a soldier or police officer armed with a certain weapon system (weapon and cartridge) to defeat an enemy. 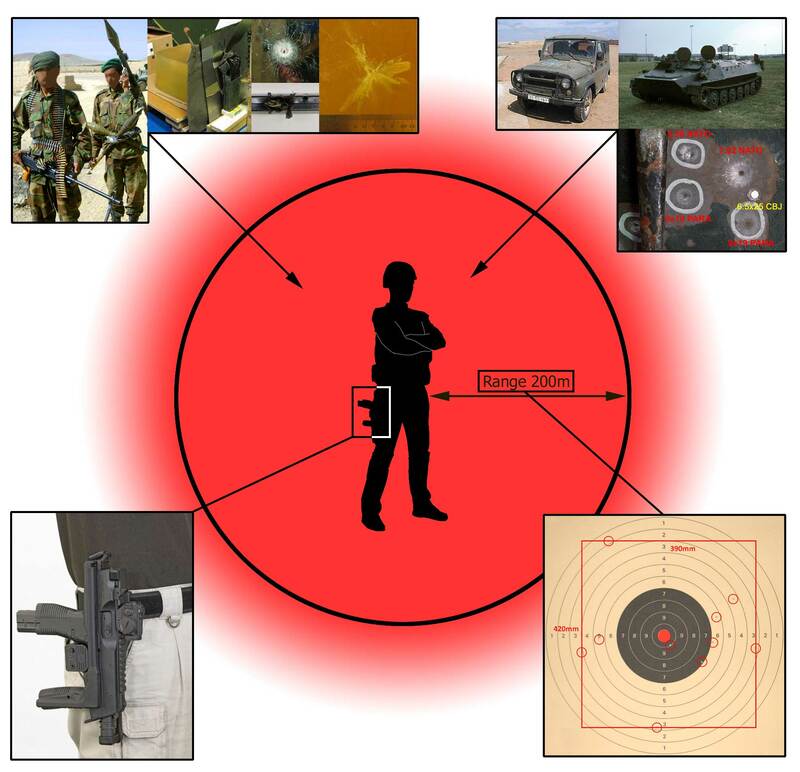 This in turn is a function of how well the weapon system is adapted to the skills of the person using the weapon, the characteristics of the target and the combat environment. Focusing on the weapon system, this means there are three main aspects to consider, which are as follows in order of importance. The ability to hit the target. To have sufficient penetration to defeat barriers protecting the target and then penetrate deep enough in the target to reach vital structures to incapacitate reliably. To have a high energy transfer to the target in order to increase the chance of rapid incapacitation. 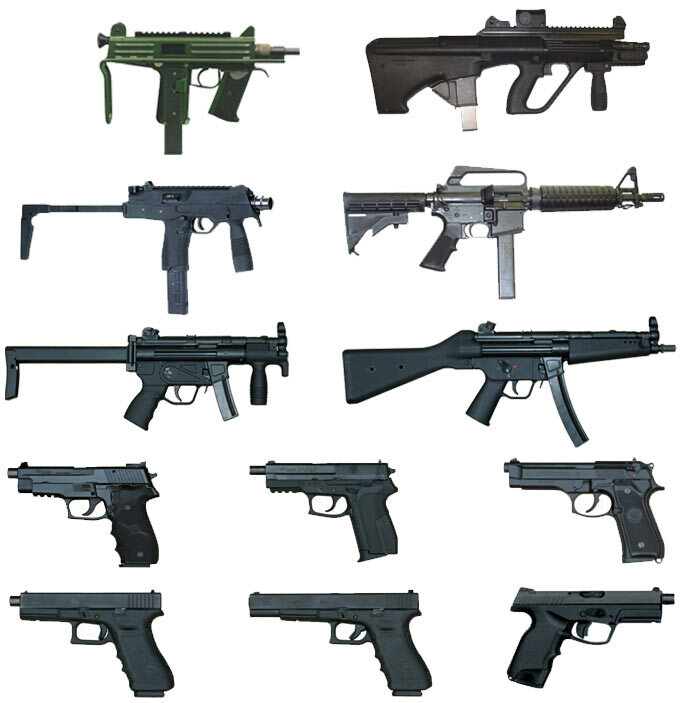 Pistols and submachine guns are weapons with distinct benefits such as low weight, compact size and, in the case of submachine guns, high firepower. However, in modern combat these weapon systems, mainly based on the 9x19 Parabellum round, are proving less effective because of lack of penetration, limited effective range and poor wounding power. 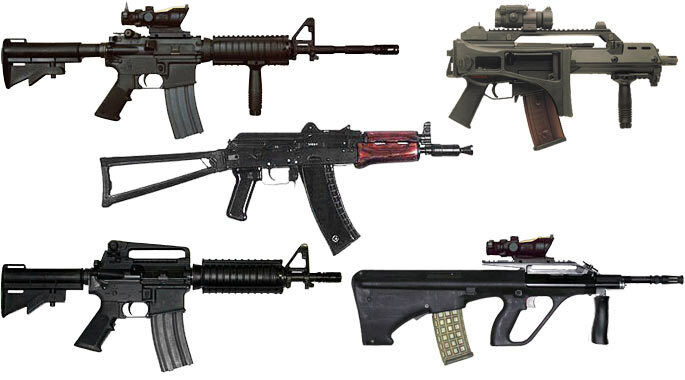 Assault rifles are increasingly used for applications that used to be typical for submachine guns, like close quarter battle etc. On the other hand, assault rifles too have important limitations. Firepower is reduced due to higher recoil and there are problems with overheating. They are heavy, and due to their length awkward to handle in vehicles and confined spaces. Attempts to make them more compact by shortening the barrel have resulted in significantly reduced wounding power, due to reduced muzzle velocity. Realizing this, CBJ Tech AB has developed a cartridge system based on the new caliber 6.5x25 CBJ. In combination with suitable weapons, the 6.5x25 CBJ covers the full range of applications traditionally covered by everything from pistols up to and in most cases including short assault rifles, and offers high firepower and superior penetration and wounding power at full combat ranges in any combat situation. Hit probability is increased because of the low recoil generated, allowing rapid firing at high precision, and in the case of fully automatic weapons, the ability to fire accurate bursts. Also, at longer ranges and at moving targets the high retained velocity of the bullet with resulting flat trajectory and short time of flight to the target reduces the need of compensation, which greatly simplifies aiming. The required penetration depends on the situation. For instance, the combat soldier generally needs more penetration than the average police officer. 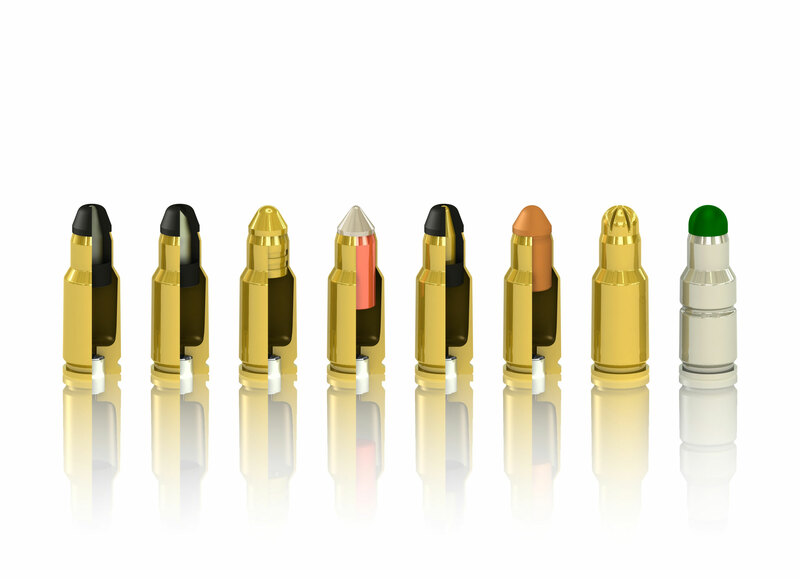 Within the 6.5x25 CBJ cartridge family, the entire spectrum of penetration is covered, from maximum penetration against tough targets to minimum penetration against unprotected targets in sensitive environments. The different variants of the 6.5x25 CBJ have high energy and effective means to transfer it to soft tissue, resulting in a high wounding effect. 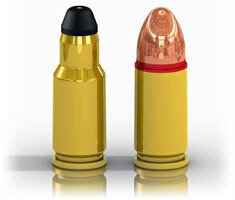 The 6.5x25 CBJ cartridge is of course primarily intended to be used in weapons designed and optimized for this caliber. However it is also designed to be used in 9x19 Parabellum weapons, converted by barrel change to the 6.5x25 CBJ. The cartridge generates the same level of impulse as the 9x19 Parabellum, which assures functioning of the weapons. The bolt face, groove and cartridge case up to the shoulder of the 6.5x25 CBJ are identical to the 9x19 Parabellum, as is the total length of the cartridge, 29.7mm. This makes the transition to the new caliber easy. Another benefit is that existing stocks of 9x19 Parabellum ammunition can still be used for training instead of being scrapped. There are many different potential users for the 6.5x25 CBJ, primarily within the military and law enforcement sector, with accordingly different demands. This includes personnel armed with pistol or PDW for personal defense and regular police units, as well as units with offensive tasks, like SWAT, Special Forces, units specialized in urban warfare, Security Forces etc. In order to be highly effective in all situations, the 6.5x25 CBJ has several cartridge alternatives, none of which contains any toxic material. For training, there are cost effective alternatives. For combat, there are different cartridge alternatives depending on the situation and desired performance. To assure effectiveness, extensive testing has been conducted. A comprehensive overview of this can be found at the Testing Page. Many tactical benefits granted by the 6.5x25 CBJ stems from high firepower, that is the ability to accurately fire many rounds in a short period of time. This however requires that an ample supply of ammunition can be carried by the soldier without increasing weight or bulk. 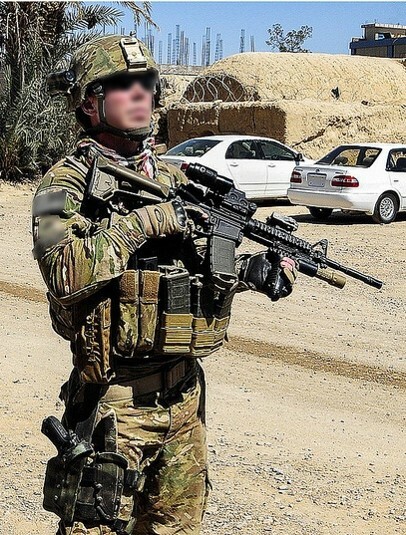 In a pouch designed for 5.56 NATO magazines, as seen in this picture, twice as many magazines and rounds of the 6.5x25 CBJ or 9x19 Parabellum can be stored. 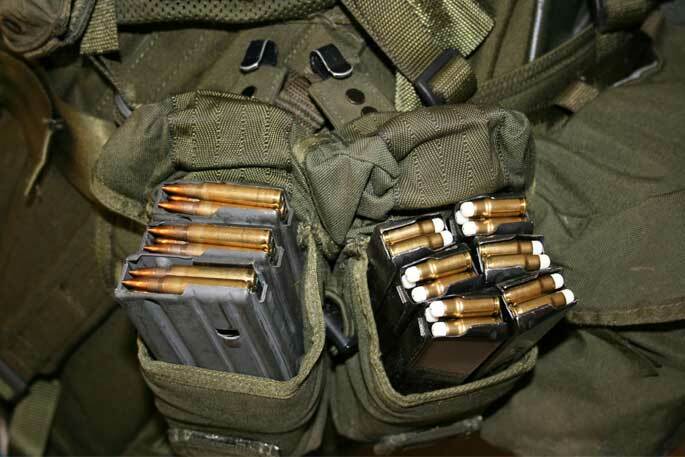 The picture shows three 30 round 5.56 NATO magazines in one pouch, and six 30 round 6.5x25 CBJ magazines in the other identical pouch. Regarding weight, not only the weight of the ammunition itself but also the weight of the weapon has to be considered. 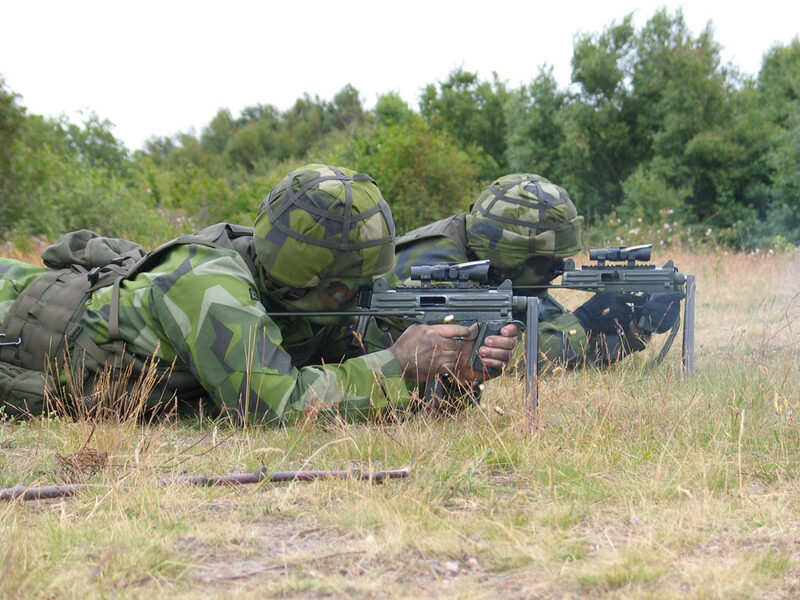 A Swedish 5.56 NATO AK5 assault rifle with red dot sight and 120 rounds in 4 magazines weighs approximately 6.5kg. This is the smallest amount of ammunition that any type of soldier is carrying. Soldiers with fighting as a primary objective usually carries more ammunition. For soldiers that does not have fighting as the primary objective, like drivers or gun crews etc., the assault rifle can many times be too big and heavy, and impede carrying out the primary task. 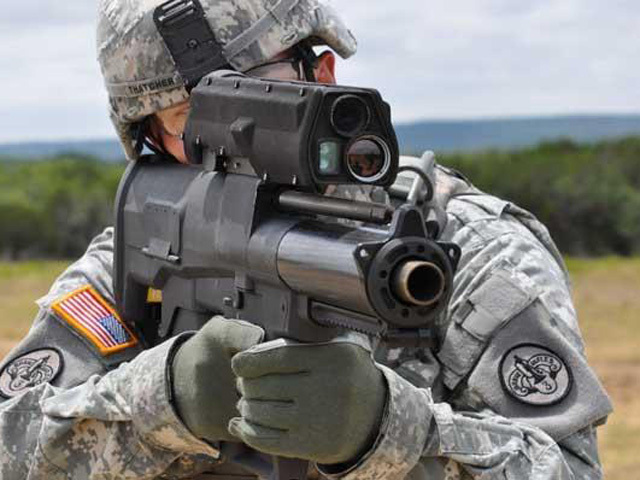 In these cases the soldier would benefit from switching to a smaller weapon system, like a PDW (Personal Defence Weapon). The picture below shows a comparison where the weapon and ammunition weighs 6.5kg in all cases, but the amount of carried ammunition varies because of the weight of the weapon as well as the weight of every cartridge. Substantially more ammunition can be carried with smaller and more suited PDWs. In the case with the 6.5x25 CBJ in a BT MP9, the amount of ammunition is increased more than four times at the same total weight. A more optimized solution may be to reduce some of the magazines and by this reduce carried weight, which is a big issue with soldiers today. This also increases flexibility to carry other equipment. Today it is common that soldiers carries a 5.56x45 Nato assault rifle as the primary weapon, and a 9x19mm pistol as a backup weapon. Basically all targets are engaged with the primary weapon at all distances, and the backup weapon is mostly used in emergency situations during malfunction of the primary weapon at close range. A not too uncommon scenario is that a squad is clearing a village and inside a house they encounters enemies and continues to clear the house. This type of combat requires a weapon that is capable of firing large amounts of ammunition during short periods of time, very often at close range. In this case there is a need for immediate incapacitation of the target, because even a lethally wounded opponent may still have time to empty the magazine back at the soldier and hit him, because of the short range. The only way to immediately incapacitate is to hit the central nerve system (CNS), and in order to do this, the shooter must be able to fire controlled bursts which substantially increases the chance of a CNS hit. The requirements for the weapon system from this scenario is a small and light weapon that is quick around the corners and has a no or very low magnification red dot sight and has the ability to fire controlled and accurate bursts in full automatic mode over an extended period of time without overheating. Historically these tasks have typically been executed with submachine guns. If we continue the scenario and the squad has cleared the building and continues on the outside. Suddenly there is incoming small arms fire from 500m away. In order to engage the enemy, there are completely different requirements for the primary weapon system. In this case, a large caliber with good long range ballistics is needed, in combination with a weapon that has good optics with magnification and a capability to fire single shots with high accuracy at long range. These requirement are completely opposite those in the first scenario, and if you want to use one system for both kind of scenarios you end up with one big compromise. At the same time, the backup weapon is sitting in its holster during both scenarios without being used. We would like to introduce a new category of weapons, the Personal Combat Weapon, or PCW. This category of weapons is very similar to the well known PDW category, but the PCW is used for both defensive and offensive roles. Let us say that we replace the 900g 9x19mm pistol with a 1,5kg two handed weapon, like the BT MP9 or similar weapon system in 6.5x25 CBJ instead. This increases the combat range from 20m to 200m. Instead of using this wepon as a backup, it is considered the primary weapon for engaging all targets normally engaged with small arms up to 200m. The user can then combine this with a high precision battle rifle, a light support weapon, a grenade based system or other types of carried equipment. 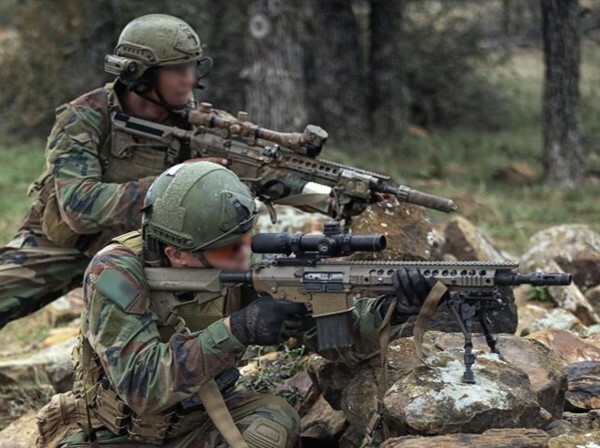 In the case with the high precision battle rifle, it can be optimized for combat from 50m – 800m or 1000m by using a larger caliber like the 7.62x51 Nato or even the .338 Lapua Magnum. This weapon does not require the same amount of carried ammunition as the 5.56x45 Nato assault rifle, because all of the short range fighting is done with the PCW. The total weight of the carried weapons and ammunition is the same but the combat range has doubled. These pictures show some examples of weapons that can be combined with the PCW.